The New York Knicks continue to struggle on the road and last night, against one of the top teams in the Western Conference, things weren’t any easier. 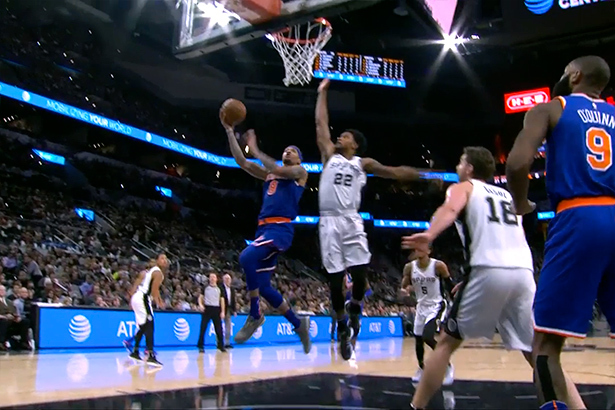 Being without Kawhi Leonard, the Spurs played an unselfish basketball, with a great ball movement and all their starters finished in double figures as they outscored the Knicks 107-119. The Knicks had a slow start defensively in the first quarter, allowing San Antonio to pour 32 points. But in the second quarter, with help from the bench, the Knicks, led by Michael Beasley successfully came back after trailing by 11 and cut the lead to just one point by halftime. They even managed to take a one point lead propelled by Frank Ntilikina and Doug McDermott but were unable to maintain the tempo as the game advanced and found themselves trailing by as many as 15 points early in the fourth quarter. Kristaps Porzingis finished with 18 points, just like Courtney Lee but was fouled out with 2:30 left to play. Beasley scored 23 points off the bench and collected 12 rebounds, showing excellent ability to shoot with both of his hands. Enes Kanter added 12 buckets while McDermott and Ntilikina dropped each 9 points – Frank also delivering 11 assists, being the only Knick to finish with a positive plus- of 4. The Spurs, led by LaMarcus Aldridge (25 points) are now 17-2 at home. Pau Gasol finished in double double, with 17 points and 11 rebounds but also dished 7 assists. Kyle Anderson scored 16, Danny Green had 15 and Tony Parker dropped 14 points for San Antonio. The Knicks are now 2-12 on the road as they connected their fourth straight loss and fell under .500 for the first time since December 9th.